Sydney and Environs. Penrith is approx 35km west from Sydney�s centre. 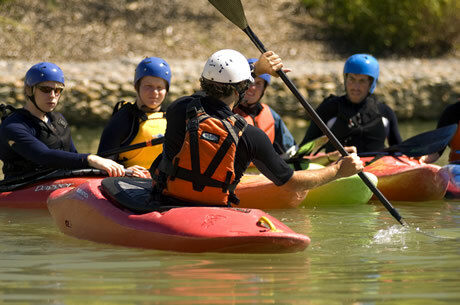 Penrith Whitewater Stadium was the competition venue for the canoe / kayak slalom events during the Sydney 2000 Olympic Games. 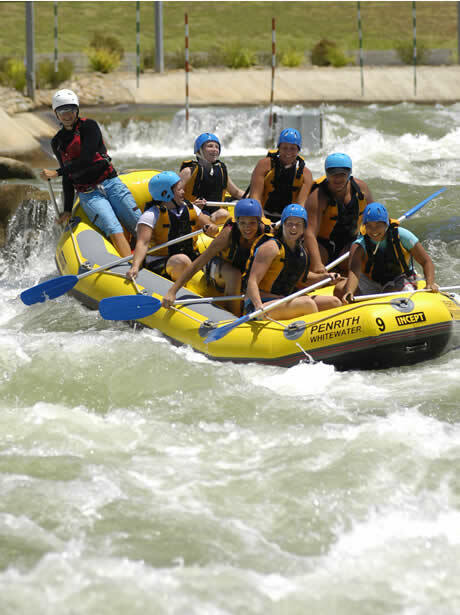 The whitewater course has been constructed using a combination of both natural and man-made materials to recreate the characteristics of a wild river. 14,000 litres per second of raging whitewater flowing over a moveable obstacle system has proven to be a challenging and exciting ride even for the best paddlers in the world. The course is 600 metres long and features a conveyor belt to transport kayaks and rafts from the finish pool to the start pool. Consistent big volume Class III rapids with some great play holes, the course is a great place for first timers on big volume water, or crazy play boaters who don’t mind going around in endless circles and dodging the many rafts which crash through. The stadium is open September to June operating times vary from season to season, so it is worthwhile phoning ahead to check available of water. Putting In: To get to the Whitewater Stadium it is simply a mater of getting on the M4 out of Sydney and following the signs just before you get to Penrith.